The Sons of Allen has grown into an important connectional movement over the past twenty-plus years and the Fellowship is becoming a true connectional ministry. In 1984, the African Methodist Episcopal Church created the Sons of Allen Men’s Fellowship to foster closer relationships between men of the church, to equip men of the church for meaningful service, to reach unchurched men, and to present positive role models for our youth. African-American men disproportionately suffer from health problems such as prostate cancer, hypertension, and cardiovascular disease, and many lack access to and/or are not inclined to seek adequate health care. As a group, African-American men suffer from economic hardships such as unemployment, joblessness, and poverty, and the resultant psychological stress. Too many African American men abuse alcohol and illegal drugs, often in response to the various pressures they face as African American men. Violence against African-American men by other African-American men threatens the stability of our communities. African-American male youth are too often relegated to special education classes and steered away from college preparatory programs. They are also more likely to be suspended or expelled and to drop out of school before graduating than their peers of other cultures. African American men are grossly over-represented as defendants in the criminal justice system and are often subject to injustice in that system through various forms of discrimination such as racial profiling, higher arrest rates, higher prosecution rates, and harsher sentences. Many African-American men feel disconnected from the church and are drastically underrepresented in the vast majority of our churches. Too many young African-American males lack positive male role models, model negative behavior displayed in the media, and turn to illegal means of earning money. Young African-American men often see the church as irrelevant, outdated and sanctimonious, and are often viewed with suspicion by church members. These are but some of the concerns that underscore the need for the African Methodist Episcopal Church to pay special attention to ministering to men. The Sons of Allen is the best existing connectional vehicle for addressing the need to minister to men in a deliberate and organized manner. The Sons of Allen has the potential to transform our churches and our communities by bringing African American men into a transforming relationship with our Lord. This ministry must function as Andrew did in John 1:40-42 when he led his brother, Peter, to Jesus. At the call of Bishop Frederick Hilborn Talbot, the Sons of Allen met for a summit in Nashville, Tennessee on April 17-18, 2004. 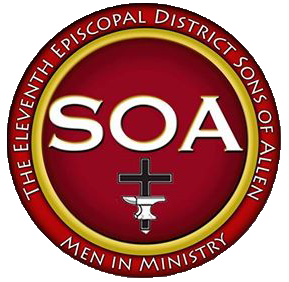 At this historic summit, the Sons of Allen took a momentous step toward becoming a fully functioning and effective connectional ministry. The members elected connectional officers, reviewed proposed legislation, and began making plans to move the ministry forward.